Despite a breeder's best efforts, Boxers do sometimes suffer from conditions to which the breed seems to be predisposed. In many instances, diagnosis and treatment will effect a cure or symptomatic relief. Like many breeds of dogs, Boxers are subject to heart ailments. These include congenital anomalies as well as acquired disease later in life. Boxer heart disease usually falls into two important categories: aortic stenosis and cardiomyopathy. This is a congenital condition, a narrowing or constriction of the outflow tract from the left ventricle to the aorta. It can be detected as a systolic murmur by your veterinarian in young puppies and older dogs. Sometimes the murmur will not show up until the dog reaches enough physical size for the constriction to become evident. This murmur must be distinguished from other types of murmurs, often so-called innocent flow murmurs that disappear as the puppy grows. There is no practical surgical treatment, and if the condition results in arrhythmias, antiarrhythmic therapy is usually instituted. Mild forms of the anomaly may go undetected and are not incompatible with a normal life span. Cardiomyopathy is an electrical-conduction disturbance (sometimes referred to as ARVC -- Arrhythmogenic Right Ventricular Cardiomyopathy), an adult onset disease of the heart muscle itself causing abnormal electrical impulses to disrupt the heart's normal rhythm. This arrhythmia may lead to sudden death or heart failure. Symptoms include weakness and/or collapse. Arrhythmias can be brought on by certain poisons, infections (notably parvovirus), severe uremia, diabetes, and heatstroke. However, in the Boxer they are most often hereditary in nature. A simple blood test is available to determine whether or not your dog is carrying the genes that may make him most susceptible to this disease. A 24 hour Holter monitor, recording the heart's activity for this period of time, may be needed to diagnose potentially life threatening arrhythmias. It is advised to begin Holters in the young adult and repeat annually thereafter. Boxers are at risk for a variety of cancers. These include malignant skin lesions as well as cancers affecting the brain, thyroid, mammary glands, testes, heart, spleen, blood, lymph system (lymphoma), and other organs. Benign skin tumors usually respond to simple surgical excision under local anesthesia. Malignancies require treatment specific to the cancer itself, and vary widely. As in humans with cancers, dogs are treated with surgery, chemotherapy, and sometimes radiation. Great advancements have been made in treatment protocols and survival times, but there is no way to predict whether your Boxer will develop cancer in his lifetime. It is prudent to be alert to any unusual growths or medical developments, especially as your Boxer ages. Consult with your veterinarian immediately if you notice anything suspicious. Early detection is important to long term survival. 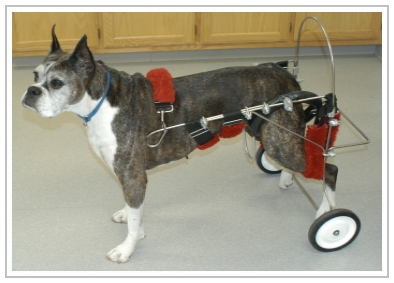 Of recent years, incidences of Degenerative Myelopathy have been widely reported in Boxers of middle and advanced age. DM is a neurological disease affecting the spinal cord and nerves coordinating the rear quarters. Over time, dogs lose the ability to walk, become incontinent, and are most often euthanized at this point. DM is a sad disease in that the patient remains mentally alert; there is no pain; and yet, keeping such an animal happy poses special challenges. There are custom carts designed to allow some patients to regain a degree of mobility. Thankfully, a blood test has been developed to predict the likelihood of your Boxer developing this condition. Breeders are making every effort to insure that future generations are not affected. The Diabetic Program at Penn Vet strives to improve the treatment of diabetes in dogs and cats, and to investigate the genetic risk for diabetes in dogs. Hip Dysplasia is a developmental disease of the hip joint that affects many breeds of dogs. The head of the femur (thigh bone) and the acetabulum (hip socket) become incompatible; the joint weakens and loses proper function. Reluctance to engage in strenuous physical activity, lameness and pain are all possible signs of dysplasia, usually manifested between the ages of 4 months to 1 year. X-rays are definitively diagnostic and will show evidence of abnormal joint laxity. Treatment is aimed at relieving symptoms of pain and includes drug therapy and/or surgery. Hip dysplasia is thought to be hereditary, but other factors such as diet and conditioning cannot be ruled out. Dogs older than 2 years can have their x-rays evaluated and may be registered free of the disease by the Orthopedic Foundation for Animals "OFA" in Columbia, Missouri. Chronic kidney disease (CKD) is often a progressive and fatal disease in dogs. Boxer dogs appear to have a predisposition for development of CKD, suggesting that kidney disease in this breed might be heritable. Owners of Boxers diagnosed with kidney disease, as well as their close relatives, are eligible to participate in a study underway at The Ohio State University to learn more about renal disease in the breed. 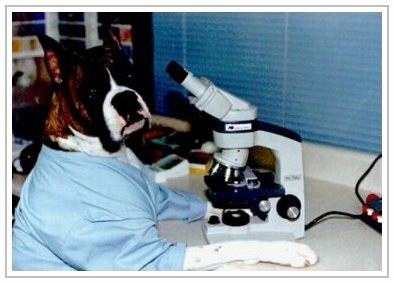 The two-year study, titled Characterization of Renal Disease in American Boxer Dogs, is funded by the AKC Canine Health Foundation with support from the American Boxer Charitable Foundation. Boxer Juvenile Kidney Disease "JKD"
This condition may be caused by an auto immune condition or tumors, among other causes. The deficient thyroid may have an effect on many organ systems, including the heart. Symptoms may include excessive hair thinning, obesity, anemia, infertility, and lethargy. Diagnosis is confirmed by a complete thyroid panel blood test. Oral doses of thyroid hormones will alleviate most symptoms and will probably need to be given for the duration of the dog's life. Luckily, thyroid therapy is relatively inexpensive and effective. Remember, many Boxers can and do live long and healthy lives. Nonetheless, it is important for owners to be alert to ills that may befall their beloved pets, so as to institute treatment as soon as possible and/or wise. 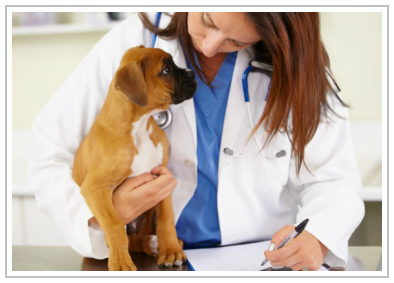 Your veterinarian is your best ally, and it is important to choose a practitioner that has a good knowledge of any breed-specific ailments that may be encountered. This website contains links to websites which are not maintained by the American Boxer Club. Links to third party websites are provided for your convenience and information only. Third party websites are not under the American Boxer Club's control and we are not responsible for the content or accuracy of those sites or the products or services offered on or through those sites. Nor can the American Boxer Club guarantee that sites will not change without our knowledge. The inclusion of a link in this website does not imply the American Boxer Club's endorsement of the third party website nor that we are affiliated with the third party website's owners or sponsors.